The two photos below represent different captions designed to frame the story in a particular manner. The first photo is from AP and was reported by Elder of Ziyon. A Palestinian rioter tries to grab a weapon from a plain clothes Israeli police officer, right, during clashes in Shuafat refugee camp in East Jerusalem. Palestinians scuffled with Israeli security forces, after an arrest operation triggered clashes in the camp the day before. An undercover Israeli police officer (R) scuffles with a Palestinian youth suspected of throwing stones while trying to detain him during clashes in the Shuafat refugee camp in the West Bank near Jerusalem. Clashes erupted between Palestinian stone throwers and Israeli police that entered the refugee camp, a Reuters witness said on Tuesday. The caption for the two photographs is actually quite different. In one sense, the descriptions do not contradict each other. They both described the scene. But it is possible to conclude with some different interpretations on the basis of the caption alone. 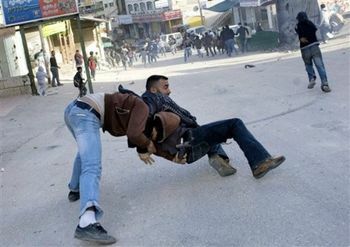 In the Reuters version the Israeli appears to be the aggressor because he is trying to “detain” the Palestinian. The readers conceptual background might easily identify the Palestinian as engaged in legitimate revolt and doing little more than throwing stones at the bigger more well armed soldier and his comrades. It is the classic David and Goliath image. Anyone writing a caption should have the typical reader in mind. 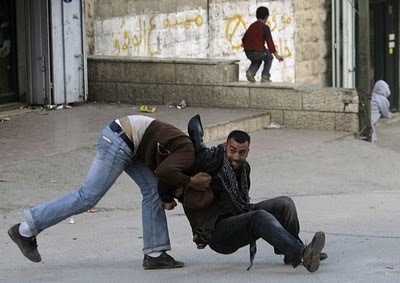 But in the AP version the Palestinian is characterized as more aggressive because he is trying to grab the weapon and will probably use it on the policeman. The policeman’s aggressive behavior would of course be justified in this case. In the Reuters version, the fighting “erupted” and apparently the Israeli police entered the refugee camp which was sufficient provocation. But in the AP version there was an arrest operation that provoked the violence. The websites “Elder of Zyion” and “Honest Reporting” claim that the Reuters organization used an Arab stringer for a description of the events. This poses an interesting question with respect to the newsgathering process and how stories are framed. Some news outlets have websites and phone numbers that one can call in order to report a story. So anyone can fill out a form on the web and provide a description of some event or activity and perhaps attract the attention of a news organization. The person leaves phone numbers and email addresses where he or she can be reached and the news organization contacts them. This of course can be an excellent source of news and is the sort of contact that results in specified and situationally-based stories. But on the other hand, this process can be abused. It can result in stories that are biased as a result of the selection process or stories, even worse, that are staged or distorted in some significant way. Actually, the description underneath the photographs is a cutline and not a caption. A caption is a little headline and a cutline describes the photograph in more detail. Reader psychology and tendencies are important because the photo sparks interest and then readers typically move underneath seeking explanations. It’s important for cutlines to perform their duties. Cutlines like stories answer the who, what, why, when, and how question of journalism. When cutlines are more on the objective side of the dimension they satisfy reader’s understanding of the picture but have not necessarily told the reader what to think. The more cutlines are politically motivated the more they draw the reader’s attention toward some specified reality on the part of the news outlet. A picture may be worth a thousand words but each of those words is capable of altering the meaning of the picture. A skilled cutline writer knows these things and chooses his words carefully. Posted on May 13, 2013, in Media and politics, Political Conflict and tagged bias, Communication strategy, News, Photography. Bookmark the permalink. Comments Off on Captions and CutLines Lie Like Cameras.